Having begun his career with 5 seasons at Atletico Mineiro, Caçapa left Brazil to spend 6 years with Lyon, between 2001 and 2007, where he was captain of the title winning side for 5 successive campaigns. Somewhat surprisingly, having been granted French citizenship in 2006, he opted to leave at the end of his contract the following summer; consequently, Newcastle United found themselves in receipt of a 31 year old Brazilian international for no transfer outlay. What could go wrong? At first, nothing; he made his debut as a 90th minute substitute in a 0-0 with Villa, becoming our 1,000th player used in the Premier League in the process and his full debut on September 1st as we beat Wigan 1-0. Until this point, all well and good; Newcastle were unbeaten, if a bit dull to watch and Caçapa seemed a steady, unspectacular stopper, with a large physical presence. Newcastle’s season began to unravel with a 1-0 loss to Derby County (their only league victory all season) in the next game, that marked the end of Allardyce’s “honeymoon,” such as it was; actually it was more like a passionless union based on mutual distaste verging on loathing, with the partners staying together for the sake of the children. Following the Derby defeat, Caçapa played 4 of the next 5 games, which saw 3 convincing home wins (he even scored a header in a 3-1 victory over Spurs) and 2 atrocious away losses, until his career on Tyneside spontaneously combusted in the most spectacular fashion imaginable. After 6 weeks on the naughty step (1 win, 2 draws, 2 losses), Caçapa returned to the side for the frankly unwatchable 1-0 away win to Fulham, achieved by a 95th minute Barton penalty, and was improbably named Man of the Match. 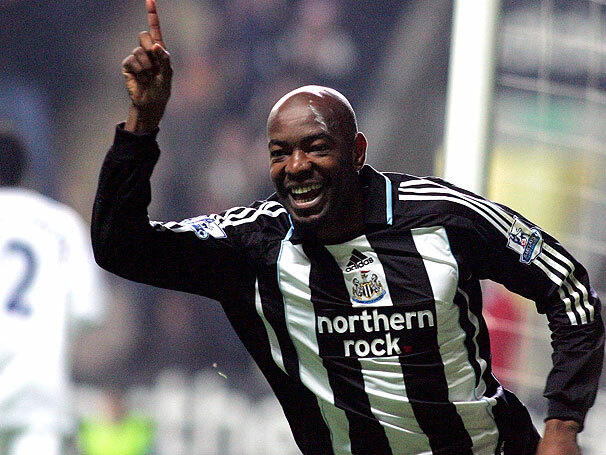 While the NUFC support had lost all confidence in Caçapa as a player after the Portsmouth debacle, he slotted anonymously back in the side and was not responsible for any major disasters as the hated Allardyce administration gave way to the populist fiasco of Keegan’s second coming. Indeed Caçapa scored in Keegan’s return game, a 4-1 battering of Stoke City in an FA Cup replay. With Rozenhal gone, NUFC were short on defenders; consequently Caçapa got his game almost by default, though his limitations were obvious in results such as 0-6 and 1-5 versus Manchester United, 0-3 against Arsenal and Liverpool and 1-4 at Villa Park. He was too slow, unable to turn, poor in the tackle and positionally atrocious. Dropping out of the side in mid-March, ostensibly because of a groin injury, coincided with NUFC going on a 7 game unbeaten run that saw us finish 11th. Caçapa returned as a substitute for the second half of a meaningless 3-1 loss to Everton on the final day, in what ought to have been his farewell appearance. Surely now, with Keegan back in charge and Ashley’s billions to bankroll the club, Newcastle United would be on an upward trajectory from the summer of 2008 onwards? The slow-motion car crash that was 2008/2009, ending with relegation and recriminations at Villa Park, saw Caçapa appear 6 times for Newcastle United; a terrible 3-1 loss to West Ham, an even worse 2-1 reverse at home to Blackburn, a lucky point at Everton, an out of character comfortable 2-0 win home to Villa, an infuriating 2-2 at home to Stoke when we’d turned round 2-0 up and finally, his swan song at Fulham. To simply state we lost 2-1 does not do Caçapa’s complicity in this spirit-crushing reverse any justice. Having clawed our way back into the game courtesy of a Shola Ameobi goal, it looked likely that Newcastle would return from the capital with a draw. Bearing in mind we were relegated by a single point, the events of the 77th minute still has a degree of resonance to this day. A Fulham cross from the left was too strong for any attackers; Caçapa at the back post six yards out ought to have allowed the waist high ball to drift harmlessly away. Instead he swung an unnecessary boot at it, misconnected and cannoned a sliced clearance off captain Coloccini’s back; we conceded, as Danny Murphy seized on a flick courtesy of the quick thinking of Andy Johnson to win the points for the Cottagers. Baldy bastards. Throughout the rest of that pitiful pantomime of a season, whether (mis)managed by Kinnear, Hughton or Shearer, no Newcastle United team featured the ageing limbs and dim-witted thought patterns of Cláudio Roberto da Silva aka Caçapa, as Newcastle United slid out of the top division after 16 years. On July 1st 2009, Caçapa slunk unmourned out of SJP forever when his contract expired, the club failing to take up their option on a third year. Caçapa wasn’t the worst player in Newcastle United’s history; he wasn’t even the worst Brazilian we’ve had (hello Fumaca), but he was painfully below Premiership standard and typical of both Allardyce’s inability to spot a decent player and Ashley’s refusal to spend the money we fans stump up on season tickets on players fit to wear the shirt. This entry was posted in The Samba Series and tagged cacapa, newcastle, samba series by The Samba Series. Bookmark the permalink.